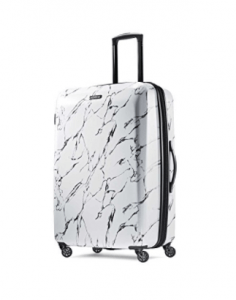 American Tourister Moonlight (92506) is a large and sturdy 28-inch size spinner suitcase that is made of solid ABS plastic with PC printed film and comes with an impressive warranty of ten long years by the manufacturer. You may purchase the Tourister Moonlight as a luggage set of 21, 24 and 28 inches. It weighs 11 pounds, which is fairly lightweight despite having a hard shell exterior and measures 28.25 x 19.5 x 12.5 inches, so you need to check it in at the airport counter. You can choose from the three color and texture options of marble (92506-T555), popsicle (92506-6571) and rose gold 92506-4357. It comes with four single spinner wheels that are great for a smooth and effortless ride and are very easy to roll 360 degrees on different grounds. This is made even easier with the solid beveled push-button retractable grip locking telescoping handle, without any weight on your arm. It locks when recessed to avoid the damage and when extended for you to pull and push it the way you like. You also have the soft top carry handle as well as the side carry handle which give you the option to hold and lift the bag horizontally and vertically, comfortably when rolling it is not an option. Despite being a hard side suitcase you can expand it by 1.5 inches for more storage capacity. You have the cross straps in the main section, book opening case with mesh divider on the other side and a zipped modesty pocket. With the rugged split case construction and the split case packing you can organize your things better and pack safely with these cross straps and a zippered panel. You can fit in quite a bit- clothes, shoes, everyday travel items and more. And you’ll be much less likely to lose it at the airport thanks to its unique colors and texture. It has a fun and colorful design for those that like different things. It opens book style and with a spacious interior, you have plenty of space for your stuff when you’re going away for long. The ABS plastic is vacuum or pressure formed, has temperature and high impact resistance making the luggage very solid and durable. And with the textured finish on top, you have the classic hard-side look. American Tourister makes stylish, modern, great quality and durable bags. It has a history dating back to 1933 when the luggage company was first started. And nowadays it is one of the best-known luggage brands globally, with a great selection of leisure and business bags. Company’s motto is “Travel should be fun!”.